Daniel O’Malley’s debut novel The Rook deservedly won the Aurealis best science fiction award in 2012. A genre mash of a novel that could only be described by its multiple influences. The Rook was X-Men meets Jason Bourne meets the X-Files with a touch of Yes, Minister thrown in for good measure. Based on a fictional secret British Government agency known as the Checquy, staffed by people with supernatural powers and protecting Britain from the X-Files-style unknown. Stiletto takes up not long after the end of The Rook. The Checquy is now in peace negotiations with its long-time enemies the Grafters. The Grafters are rogue scientists who distrust the “demonic” Checquy and have the ability to biomodify themselves and others. The Checquy all but wiped out the Grafters hundreds of years before and the enmity has been brewing ever since. But just as a fragile peace is one the table a third party emerges to derail the negotiations. 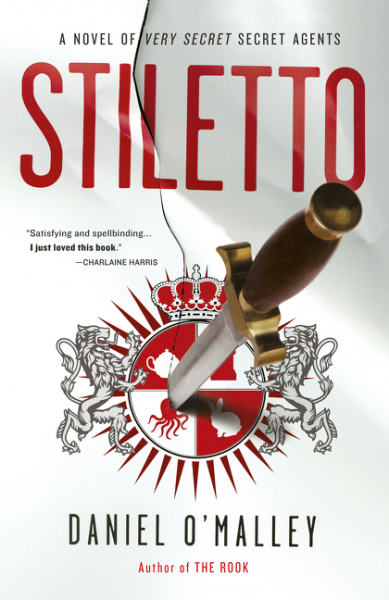 Stiletto has much of the verve and many of the weird supernatural-meets-secret-service action set pieces of its predecessor. But it is overly long. It takes close to 200 pages for the plot to start moving. O’Malley fills the spaces with exposition, backstory and a couple of lackluster B-plots. Even the (fairly predictable) climax is preceded by an unnecessary (though fun) action scene followed by pages of expository dialogue. Myfanwy Thomas, the heroine of The Rook, is back and is still this series’ most rounded and interesting character. Stiletto also introduces two new likeable characters to be the reader’s eyes on the action – Grafter Odette and her Checquy minder Felicity Clements. The two start off hating and distrusting each other and their arc towards mutual understanding is standard buddy-movie fare. Fans of this series, who like spending time in O’Malley’s world as much as he does will speed through Stiletto. And it is enjoyable. But for all of the action, satire and surprises that it does manage to pack in, Stiletto does not quite live up to the promise of its predecessor. A version of this review first appeared in Aurealis #90, Australian Science Fiction and Fantasy Magazine.